Since MBA programs and their value are are this week’s topic I turned to US News and World Report columnist and author Kimberly Palmer. 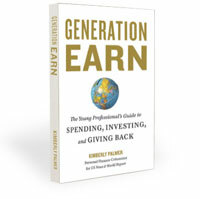 You’ve probably heard of the US News & World report college rankings but you may not have heard about Kimberly’s new book, Generation Earn. The second chapter is titled “Job Juggling” and one of the things Kim talks about is getting ahead in your career. Since enrolling in an MBA program is often considered a major career move I thought I’d ask her a few questions about the value of an MBA. Kim summarized several of the key points covered in Generation Earn into top money tips for young professionals. I picked five of these tips to look at various aspects of choosing an MBA and asked her a question for each one. 1) Don’t scrimp on career-related investments. Question: How much do you think is too much to pay for an MBA? What’s a good rule of thumb? It all depends on what you plan to do after you graduate, and how much you can earn doing it. The best way to figure that out is to talk to recent grads from the school. How hard was it to get hired? What’s the average starting salary the first year after graduation? Most schools make that information public, based on surveys of grads. If you plan to live in an area without a lot of lucrative business jobs, or go into a field (such as nonprofits) that doesn’t pay as well, then you could be stuck with a student loan bill that’s really hard to pay back. There are cheaper ways to get an MBA, such as going part-time while working or getting your job to pay for it, that are worth looking into. Question: How can people know whether hiring a coach or going back to school can be a bigger help to them? People who feel like they’re at a crossroads or unsure what they want to do next are the ones who benefit most from working with a career coach. Coaches can help you nail down your goals and come up with a plan for getting there. If you already know exactly what you want to do and have done research on different school programs, then going back to school can be a great decision. The people who end up regretting going back to school are the ones who end up getting a degree for something they don’t actually want to do. Question: Can you ask for a raise because you got an MBA? Yes! Any change – a new degree, new hours, new responsibilities – is a great excuse to ask for a raise. If you’ve become more valuable to your employer, then make the case that you’re currently underpaid. At the same time, check out other opportunities in case you don’t get the raise at your current job. Sometimes changing jobs is the best way to make more money. 4) Cultivate your most ambitious dreams. Question: Do you think sometimes people get an MBA because they want to be high achievers but don’t really know what their dreams are so don’t know what to aim for? Yes, this happens with MBAs, law degrees, and post-graduate English and history degrees. Going to school is the ultimate way to delay making big decisions about your career. But it’s also the most expensive way to procrastinate. Why not take a non-career job for a year or two instead? 5) Get a second (or third) job. Question: If you only have time to go back to school or start a second job, how do you decide which is better? You have to ask yourself what your ultimate goal is, and which one will you there. If you want to be a novelist, then getting an English degree might be better for you than earning extra money at a retailer – or doing neither, so you have more time for writing. If the second job is just for the money, you might be better off re-arranging your budget to be more frugal, so you don’t need the extra money and can have the extra time instead. Having time and the flexibility to spend your energy the way you want it is worth much more than any $100,000 job. Thanks to Kim for sharing her thoughts on going back to school and also for packaging all her years of experience as a financial journalist into a great resource in Generation Earn!